CNN International Commercial commissioned new research that shows huge demand from worldwide audiences in following the story of this year’s US Elections. The study also confirms CNN as the leading international media covering the US Election – building on the network’s agenda-setting coverage and record TV and digital ratings during the Presidential race so far. To understand how the world views and is following one of the biggest stories of 2016, CNN commissioned independent research company Toluna to assess* the viewing habits and opinions of adults in 23 countries across Europe, Middle East, Africa, Latin America and Asia Pacific, plus Canada. The findings of this research were released ahead of CNN International launching a new nightly US Election show – State of the Race. From 16 May, the show will be anchored from CNN’s New York bureau by Kate Bolduan and give international audiences 30 minutes of insight and analysis into the story that the world is watching with intense interest. In the research findings released today, 51% of all respondents select CNN as the #1 international news provider for following the US Election – a figure higher than all other news organisations combined and dwarfing any preference for other media such as BBC (19%), Reuters (5%) and Sky News (4%). 78% of respondents say they have viewed or read CNN coverage, with 83% of these people consuming CNN’s political content within the last week. The majority of people getting their news fix about the US Election are doing so through CNN International’s linear channel – 50% say they consume via TV, 31% on the CNN website, 14% on social media and 8% via the CNN app. Outside of news consumption habits, the study found huge interest amongst international audiences for the US Election. 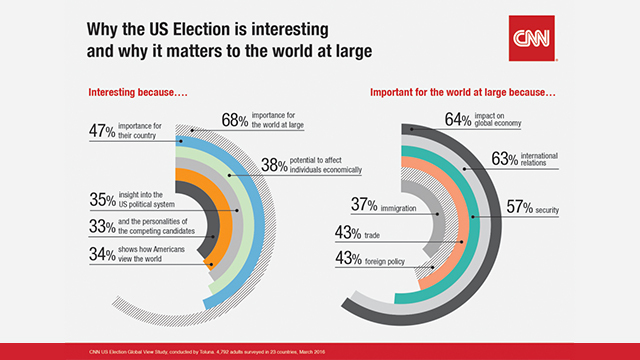 85% of people view the election as important for the world at large, with 73% of respondents saying they are personally interested in US Election news. The top reasons that people state as why they are interested in the US Election are: importance for the world at large (68%); importance for their country (47%); potential to affect individuals economically (38%); insight into the US political system (35%); shows how Americans view the world (34%); and the personalities of the competing candidates (33%). Asked why they think the US Election is important to the world at large – respondents say it is due to: the US’s significance to the global economy (64%); implications for international relations (63%); US’s role in global security and counter-terrorism (57%); trade prospects and potential for a shift to more hardline US foreign policy (both 43%). Specifically commenting on CNN’s coverage of the US Election, 66% say the network’s coverage is informed and intelligent, 64% expertly presented, 64% comprehensive, 62% engaging, and 60% as setting the standard. These findings follow record-breaking TV and digital ratings in CNN US for the network’s coverage of the election. With CNN leading the way in exclusive interviews, townhalls and debates, the network had its most watched quarter in seven years in January-March 2016 – a performance that saw CNN as the fastest growing Top 40 cable network in primetime, up triple-digits in total viewers and adults 25-54. In September 2015, CNN broadcast the most-watched programme in its history as its GOP debate was watched by an average 23.1 million people. On digital, CNN Politics posted its highest ever traffic in February 2016 – in its 12th straight month as the US’s #1 source for political news online, it had a record 36 million unique multiplatform visitors. *CNN US Election Global View Study, conducted by Toluna, surveyed 4,792 adults in 23 countries across Europe, Middle East, Africa, Latin America and Asia Pacific (+ Canada). The study was conducted in March 2016.